I’ve been a pretty fortunate gringo as I am blessed with three families, one by blood and two by adoption of sorts. After I moved to DC in the early 2000s not knowing a person in the world I quickly made two friends, one Colombian and the other Cuban; both obviously from Spanish speaking cultures but very different especially in their approach to food. 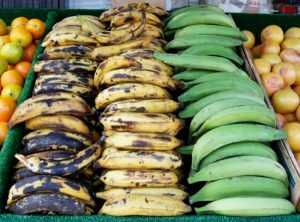 One common food stuff linking the two (and a great number of cultures around the world), Plantains – the other starch of the Americas. It wasn’t that I was unfamiliar with them entirely. I knew their name; I’d seen them but I’d more or less snubbed them due to the similarity with bananas. I was, however, unfamiliar with the incredibly important distinction between green and yellow plantains. This distinction is where one finds an array of culinary utility ranging from savory to sweet uses. 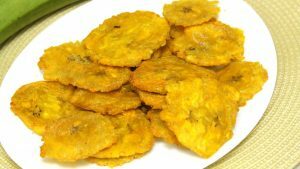 My first experience came by way of the Colombian family who invited me to supper one evening where ‘patacones’ were served alongside a couple of traditional dishes. Gold fried disks were presented with some lime and salt. Being that they were deep fried, I was already in it and ready for a taste adventure. So to be honest, I wasn’t exactly bowled over by them. They looked and smelled great but the taste, well, it was kinda this thick starchy crisp on the outside, soft on the inside, mini-frisbee. In fact, I actually wondered how effective they’d be skipping them across the top of a pond. I did not share this thought at the risk of offending my newly minted friends. However, my gringo-ness was on full display when I asked for some ranch dressing to dip them in. With great reluctance my hosts joined in the dipping and almost with chagrin there were nods that in fact, they were really good with ranch….but hell, what isn’t? Fast forward a couple of years later and I meet my Cuban family. Supper starts, though more spirited brought on no doubt by the presence of many rum drinks and Celia Cruz wooing us into some salsa steps, when low and behold those same golden mini-frisbees appear before me. Me wanting to show a little Spanish cred I immediately, and with a casual offhandedness about the whole situation, say ‘oh great, patacones, I love those.” Yeah, I love them as long as they are swimming in ranch dressing. My hosts smile and say I’ve been hanging out with Colombians because no one in the rest of the known world calls them patacones. Tostones! And that night I become a convert to Tostones over Patacones. They are seemingly identical except that the Cubans brine their plantains before the double fry plus they press them to a thinner disk allowing them to get even more crispy. Being a bit of a salt whore, I tore into their tostones with no ranch dressing required. This same Cuban family also introduced me to mariquitas, which are long thinly sliced and deep fried plantains that are more like potato chips. Mariquita, the word, also has another ‘culturally’ relative meaning but I’ll leave you dear reader to explore that on your own. All of the aforementioned preps use green plantains. Central Americans taught me about Maduros which are fried yellow plantains yielding a nice sweet dish; sorta like po-folks version of bananas foster without the grandeur. Puerto Rican’s taught me about Mufongo which is frankly, and this is a very technical culinary term, AMAZEBALLZ hell-a-good. Mufongo is a semi-ripe plantain dish combined with gnarly, fatty, pieces of pork (chicharrones), molded into a mound and served with more starch. One restaurant in Puerto Rico up’ed their mufongo game by molding it into the shape of a bowl, deep frying it, then filling the interior with ox-tail stew. Sweet sparkly baby Jesus that was good! And there are literally hundreds if not thousands of additional ways to prepare plantains from tamales to relleno (stuffed), to drinks, to bread. Honestly, plantains are every bit as versatile as potatoes. That’s one of the reasons I’ve been amazed that American culture has adopted the plantain in everyday life. They are cheap and readily available anywhere there is a decent sized Latino community of almost any origin. 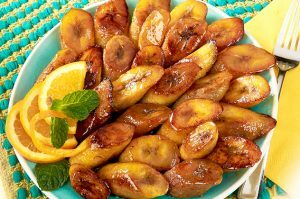 I just did a search on Pinterest and the number of plantain recipes is staggering; so maybe they are catching on. I haven’t tried myself as of yet, but I’m guessing because of the starch and the lower water content of green plantains, they’d make some damn fine hash-browns as well. I say this because I have diced them for a hash with eggs and masitas (fried pork chucks) and they browned up fantastically well. If you are bored with the same ole potato or rice dishes, go out and get yourself some plantains and experiment. They will open up a universe of new uses and your friends will think how exotic and interesting you’ve become- ok, no they won’t, but you’ll feel you’re more interesting.